Ebooks supplied through the EBL platform will be unavailable on Sunday 2 March from 1:00-5:00 pm. Enhancements and updates to the EBL system are being put in place. We apologize for any inconvenience this may cause. Unitec does subscribe to other ebooks suppliers, and these are unaffected by this outage. For more information see our Study Guide on ebooks at Unitec Library. On Saturdays the SCC will be staffed by the AskIMS helpdesk (on other days it is staffed by Library student computing advisor Hemant Patel, assisted by Lyle and Erick). As a general rule the SCC drop-in lab will not be available on Sundays this year. However the Main Library in B110 will be open every day including Sunday. It has 42 computers and 4 MFDs as well as laptops for loan. See full details of Main Library hours and SCC hours. We are continually looking at how we can improve the SCC service and space (within budget constraints), and we welcome your input. If you have any questions or feedback, please email us at library@unitec.ac.nz or feedback about SCC online. 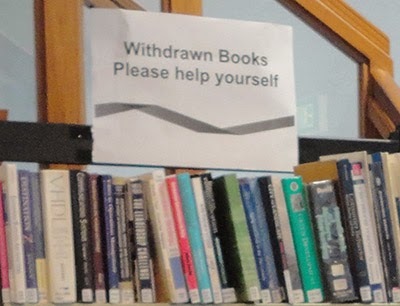 We have thousands of old books that we have withdrawn from the Library collection. Each week we will put out more books in the following places: The Main Library foyer area, and just outside and inside the Student Computer Centre in the Hub. Please feel free to browse the shelves and take as many of these books as you wish. THERE IS NO LIMIT! 2) The weeding has enabled us to create more student study spaces in the Main Library. Before we discard books we are placing them on shelves in three areas: the Main Library foyer area (pictured above) and just outside and inside the Student Computer Centre in the hub. Books will be added and removed weekly. Please feel free to pop along and browse the shelves and take as many of these books as you wish. There is no limit! We suggest you bring a book bag with you or feel free to take one of the plastic bags provided. If you have any questions about our withdrawals process please contact the library or leave a message on our facebook page. Here are a couple of library workshops which are coming up soon. They are open to staff and postgrad students so be sure to come along if you need a hand with anything! This workshop is an exploration of the different places to look for information and how to search more effectively. A reminder of how to manage and evaluate information. Unitec Library now has about 200,000 ebooks on a range of subjects. Find out how to access these efficiently and learn how you can use them.